I’ve not had the time to blog much lately, apologies. You can catch up with my weekly column on The Latest or Brighton & Hove Independent websites. Below are two letters to Mr Duncan Smith highlighting serious concerns about how his department is treating local government. We appreciate that the introduction of Universal Credit is no longer on the government’s original timetable. While delays that help ensure effective implementation are to be welcomed, I need to alert you that this creates additional financial pressures for councils. You may be aware that the administration of housing benefit is funded by a specific grant from the Department for Work and Pensions (DWP). I am sure the original intention of this grant was to fully support local government in providing a service on its behalf. However unfortunately its costs have long outstripped its funding – in the latest national comparative figures available, 2012/13 national Housing Benefit Administration expenditure was expected to be 74% higher than the grant ( 102% in London and 69% in Unitary authorities) and for Brighton & Hove this was 98% – representing a subsidy from the council’s General fund of £2.938m. The administration grant continues to be subject to reductions, 10% for 2014/15 and yet the delays to the implementation of Universal Credit alongside reforms mean that efficiency savings of this magnitude are increasingly challenging. For example as individuals find they need to take more than one job or find themselves moving in and out of work more frequently so their circumstances require more frequent reassessing from a benefits perspective. This adds additional cost and complexity that will only be resolved at the point at which Universal Credit is introduced. In 2014/15 the gap between expenditure and income for Housing Benefits for Brighton & Hove is expected to be £3.397m – a direct subsidy from the council’s General Fund to deliver a DWP programme. While the council continues to review and benchmark its service against comparable local authorities, there is no evidence at the moment that this is out of line with others. We appreciate that there is a desire to constantly improve efficiency and reduce costs to the taxpayer. We, like many authorities, have successfully driven down our costs while maintaining high standards of service. 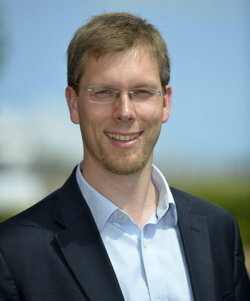 However there does come a point, when service effectiveness is a matter of having enough resource to meet demand and while we continue to strive to make our service more efficient the gap between funding and actual cost is an increasing burden that Local Government cannot afford to accept on the DWP’s behalf. I therefore call on you to reconsider the funding position for HB admin subsidy to let our costs be covered. The money that has been taken out of the admin grant over the years makes it increasingly difficult of us to deliver this statutory social security benefit on your behalf. Other local services have had to be cut to fund our ongoing delivery of this national benefit. I do not believe taxpayers would consider this fair or justifiable. We are aware that the Autumn Statement 2013 has confirmed that government plans to implement a Single Fraud Investigation Service (SFIS) during 2014. Brighton & Hove City Council is very concerned at the current plans to operate SFIS as an organisation wholly managed and operated by the Department of Work and Pensions (DWP). We believe current plans have been adopted without due consideration to local authorities’ views and without full consideration of the impact such changes would have on counter fraud activity outside of SFIS, especially those areas under the remit of local government. We would strongly urge you to reconsider how SFIS is implemented. We recognise that SFIS could be a great opportunity to make a real difference to investigating welfare and related frauds and to work in a truly collaborative way. As it stands, we believe that local authorities will be left more vulnerable to fraud attacks if current proposals go ahead. We also believe that reported savings of operating SFIS could therefore be offset by wider fraud losses across local government. In this council, not only do we operate a Housing Benefit investigation team but we also host one of two National Anti-Fraud Network (NAFN) offices that provides first class data and intelligence services to over 350 councils. Through these services, currently it is common for local authorities to link investigations together e.g. ‘blue badge’ fraud and benefit frauds; housing tenancy fraud and benefit fraud. Under SFIS proposals, much of the benefit of this type of combined investigation will disappear, as will any links between local authority corporate fraud work and SFIS. This simply does not make sense. Allied to this, there will be no or limited links between SFIS investigations and Council Tax Reduction Scheme investigations. Again, a collaborative approach would be our preferred solution rather than two separate investigations undertaken by different organisations with potentially two separate prosecutions being undertaken at the same time. There is potential for significant process duplication and preventable costs. At Brighton & Hove, in common with a number of authorities, we have recently set up a Corporate Fraud Team to undertake fraud investigations across a wider spectrum of our activities. We are concerned that the current proposals do not provide sufficient time to develop this unit and also that any work it carries out in future will be in isolation from SFIS. Again, this would not appear to be well thought through, especially with the introduction of powers to make housing tenancy fraud a criminal offence. NAFN is recognised as a centre of excellence in local government and its services extend well beyond local authorities. For instance, NAFN processes all of the DWP’s fraud related vehicle checks. The introduction of SFIS as currently proposed would be likely to reduce NAFN resources considerably and therefore the impact on the wider fraud community in terms of protecting public funds could be considerable. We are also concerned about the impact on localism. Centralisation of welfare benefit fraud investigations would appear to go against the grain of the localism agenda supported by the rest of government. We would strongly urge further constructive and meaningful consultation on current proposals so that we can identify a solution that would be beneficial to all areas of central and local government. Should you have any queries or wish to discuss the matter any further, I would be most willing to provide further information or meet you to talk through these issues. This week we have published our draft council budget proposals for 2013/14. Despite almost weekly changes from Government, we are continuing with our ‘open book’ approach and have published the bulk of our plans now – much earlier than previous administrations have done. This year the Coalition government have continued their increasingly harmful austerity measures, targeting local government more than ever. While Whitehall have reduced their budgets by 8%, councils have already reduced spending by 28%. Delivering around 800 services, more often than not it is the council that gets new homes and classrooms built, supports local business innovation and improves quality of life through transport, public health and planning. Despite experts lining up to tell government that wildly cutting council resources only damages our local economies and local services, the government is refusing to listen. However government announcements in recent months have taken a further £10m from the city than we had expected when work started on the 2013/14 budget in June. Thankfully our introduction of a 2-year budgeting process and the forward-planning it encouraged, meant we could bring forward some proposals from 2014/15 to help meet this growing challenge. We also are on track to deliver a significant underspend for the second year running, because of our excellent officers and our commitment to managing every penny spent carefully. As a result we have been able to protect all branch libraries and children’s centres for another year, despite Coalition austerity measures. We have set aside £100k to provide business rate incentives for the kind of firms we want to attract to our city. We’ve identified £300k of funding to support third sector finance advice services that are seeing demand skyrocket due to welfare cuts. By investing in these services we know we are preventing bigger problems in the future for those struggling to make ends meet, whilst also supporting valuable third sector organisations in our city. We are working hard to find new ways of bringing external money to the city, such as the commercial deal with the i360 where a loan from the national Public Works Loans Board will generate income for the council. We will maintain a significant investment in transport improvements, including a pilot scheme to control verge parking, and a new, more accurate real time bus information service. Thanks to our clear commitment, we are attracting significant external funding to make our own money go further. This is a digital, creative city, which hosts an incredible range of businesses and research, We will be investing in the digital infrastructure needed to keep us at the cutting edge of innovation and entrepreneurship. Our city has had a raw deal from government, but we’re committed to doing as much as possible to protect services for the benefit of everyone who needs them. I believe the draft budget sets our council on the right course for reducing our spending while delivering for our city. The next financial year in Brighton & Hove will see a first… the first ever Green council budget will be the basis of how our council runs. Last night was the budget council meeting where we Greens proposed and passed our budget. In the face of the government’s harsh, ill-conceived austerity programme it was a budget of political hope. To show that change is possible, that Labour and Tories don’t have an unbreakable grip on political power. Our budget showed up the opposition’s favourite lie, that Greens aren’t up to the job of governing. In the face of above average government cuts our budget protected so much that the vulnerable and needy in our city depend on. We protected grants for the third sector, the adult social care eligibility criteria, the parks service, support for carers, staff terms and conditions, the living wage for our lowest paid staff, the preventing homelessness budget, youth services and branch libraries. We’ve expanded joint working with the third sector and public sector both in and out of the city. Overall the budgets for children’s and adult social care budgets will see no decline over two years. We produced this budget in a new way – more open, more inclusive with more detail than ever before. We produced a two year budget for the first time, publishing earlier than ever before. We involved the opposition parties, unions and community & voluntary sector more often and in more detail than ever before. For the first time there is a carbon budget, we have expanded the equality impact assessment process and extended the Value For Money programme to find greater efficiencies. The capital programme also had a huge amount of positives, the Local Transport Plan funding almost doubled and completely protected for use on improving city infrastructure for the first time in living memory. Funding for new school places, a new library, solar panels, investment in social care buildings and much more. Yes, due to government cuts, some services will be reduced, fees will go up, efficiencies will be found – but so much has been protected. We acknowledged the concerns of allotment holders over free increases there, which is why we responded by spreading the increases over two years. Over the next year I’m committed to working with the allotment community to expand concessionary rates, open new allotments and address the issues they’ve raised. We had new initiatives too like £300k to fund 3rd sector youth services, £120k from auctioning the mayor’s number plate to fund 3rd sector capital investment, pilots for food waste and commercial waste collections. We also proposed to reject the Tory tax freeze. Our 3.5% council tax increase, one of the lowest increases in this council’s history, would protect our funding base and help us to offset the worst of the cuts. A tax position supported by GMB, Unison and NUT unions and followed by 30 councils around the country. They all could see that the one-off tax freeze the Tory government wanted us to take this year was a con trick, which would leave us worse off in the long run. And so it proved to be, we will be worse off in the long run now. Sadly, and I truly mean that, the Labour group — despite our repeated attempts to negotiate with them — produced an amendment which was almost identical to the Tory amendment to introduce a tax freeze. They have started to think just like Tories. So whilst shocking Tory amendments to close a nursery, axe union officers and slash support for those experiencing benefit cuts were defeated, Tories and Labour voted together to adopt the tax freeze. You expect Tories to cut government, that’s what they do. But for Labour, when we’re experiencing above average cuts as a city (indeed the highest for our region), to push more cuts on this council is utterly shocking. Their amendment slashed funding for our sustainability team, cut funding for training staff, reduced council communications with residents, cut funding for bringing private empty homes back into use whilst adding an additional £3.6m cut to next year’s budget – without any attempt to explain how they would pay for that. Despite having made so much noise on City in Bloom, public toilets, sports fees, children’s centres and more none of these were in their amendment. In fact they never even submitted a petition on those issues – they were just leaflet fodder for them. This city has seen New Labour become Blue Labour as they’ve shifted hard right, falling into the Tory trap of the tax freeze, which leaves our council worse off for years to come. Labour also have made false claims that they’ve saved the mobile library. They haven’t. Their amendment to fund a new vehicle is £40,000 short on the running costs. Unless they can identify that money there’s no new mobile library – another financial gimmick is all they could offer. Clearly I am disappointed that the tax freeze was imposed on our budget. But that’s democracy, the other two parties voted for a Tory policy and voters will know who added to the burden of cuts and austerity in our city. We voted against the amendments. There were many, many speeches last night, some of them good. My wife and ward colleague made her mark with a witty maiden speech rebutting some nasty xenophobia from the Tory benches. Not everyone likes the theatrics of council meetings, but I think it’s important every councillor is given the chance to explain their views and position if they so wish. I personally do enjoy hearing the views expressed, even if they do sometimes exasperate. With only one amendment passing, we were left with an over 99% Green budget. None of us want there to be cuts, Greens adamantly oppose cuts and austerity, but sadly our system of government gives the council little choice on the reductions passed down to us. The Green budget was a fair budget for tough times, protecting vital services. Clearly the other parties agreed, joining us in voting through our financial plans for the next year. My door remains open to opposition councillors wanting to begin the co-operative working they’ve so far felt unable to embark on. But first and foremost I’m focussed on delivering our Green manifesto and budget to build a better, fairer city for our future. The end of January saw councillors pile into a full council meeting at Hove Town Hall. It was the final opportunity for full council motions and petitions before the budget council meeting on 23rd February. We’ve seen yet more rhetoric on the budget from all sides. The huge contradictions in the positions the opposition are taking have been particularly notable. In the same meeting Greens were accused of being ideological and making U-turns – which is somewhat contradictory! Either we’re making choices out of belief, regardless of context, or we’re changing our minds in response to feedback but it can’t be both. Similarly we’ve seen both Tories and Labour oppose a wide range of our revenue raising ideas: fees & charges, changes to parking tariffs and council tax plans. Yet they’ve also opposed many of our ideas for saving money. The result would be a hugely imbalanced budget. We’ve yet to see any suggestions on how they would fund their ideas and make the budget balance. I appreciate that savings this and next year will have to be made to help achieve this [the tax freeze] – but this is also for councils to reform, restructure and innovate, and lower your spending base permanently. This is the same old Tory policy, reduce government by hook or by crook. So no real surprises there, though dressing it as a tax freeze is a nasty bit of spin. What I find extraordinary is how the Brighton & Hove Labour party continue to support this Tory policy. Again and again they back Tories locally and nationally by supporting this freeze which will mean £5.4m less over two years to protect council jobs and services in our city. The branch secretaries of the the local GMB, Unison and NUT unions support the Green tax plan, but Labour aren’t listening. For them to protest the cuts yet actually support one of the most cynical Tory slashes is extraordinary. Last year, in opposition, Green councillors published an alternative budget to further the council budget debate and explain our position. This year both Labour and Tories say they couldn’t do such a thing and so they continue to make nothing but un-costed claims. It’s a shame they haven’t felt able to participate more meaningfully in the council budget dialogue. We will persist with a more open budget process and I hope in coming years opposition parties will take a greater role in building informed debate. For this year, the list of tax freeze rebel councils keeps growing, and we’ll keep talking with residents as the budget council meeting approaches. At the Conservative Party conference this autumn ministers announced a new gimmick: a council tax freeze grant. If councils agreed to keep council tax at the same rate as the previous year they would get a grant worth the equivalent of a 2.5% increase, for one year only. On the face of it a clever way to show that Conservatives care about the squeezed middle classes in the face of increased inflation. Yet the harsh reality is this scheme doesn’t make financial sense for councils, and is yet another way the government are slashing budgets for local services. And in the long run it would likely lead to even greater council tax increases. It’s absolutely clear to me that Greens were voted the largest party on Brighton & Hove City Council because of our commitment to public services and resisting the Tory agenda of “small government”. Residents expect us to use our Green values to fight for the fairest possible settlement in the face of unprecedented cuts from central government. The tax freeze grant is another attack, a wolf in sheep’s clothing, which we oppose. Why is it bad for the council? Because it would over 2 years cost us £5.4m, and more over the longer term. Let’s explore that in detail with an imaginary council called Picklesville with a £100 of income this year from council tax. For the next year the councillors in Picklesville can either take the government’s grant worth a 2.5% increase or go with the Green option of a 3.5% increase. If they take the government route they will receive £100 + £2.50 = £102.50 (£2.50 being the 2.5% grant from government). 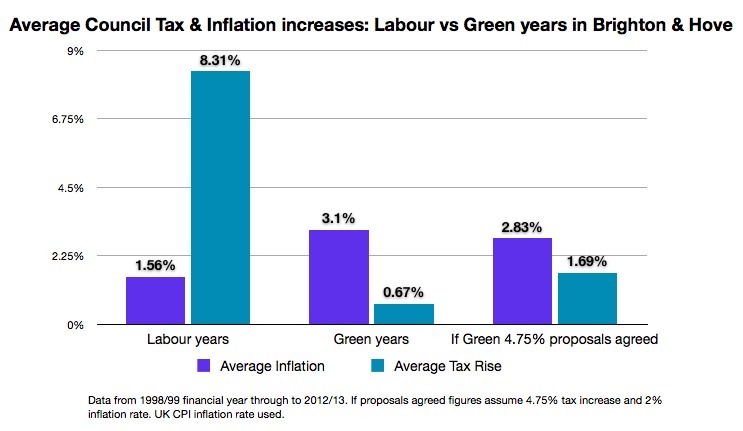 If they go the Green route they will receive £100 + £3.50 = £103.50 (£3.50 being the 3.5% increase on council tax). The next year the Picklesville councillors again need to decide on council tax. If they went for the government grant, that is now gone. So to catch up in the face of continued reductions in their formula grant (the other main source of income for councils other than charges) they decide to put council tax up by the maximum allowed, which is 3.5%. However because of last year’s freeze the starting point hasn’t moved. So they will receive £100 + £3.50 = £103.50 (£3.50 being the 3.5% increase on council tax over the previous year). 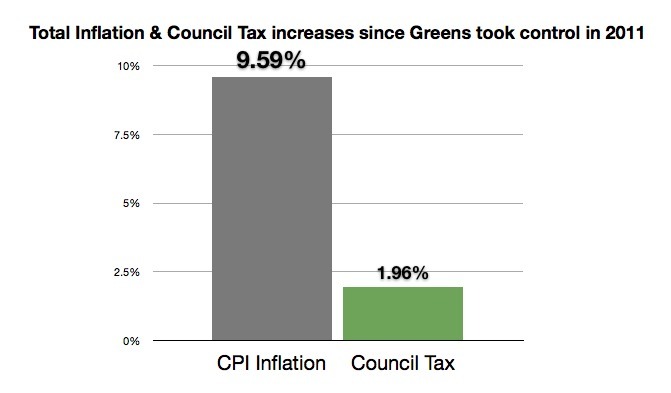 If they had gone the Green route then, still facing huge cuts in formula grant, they also decide to increase council tax by 3.5% so they receive £103.50 + £3.62 = £107.12 (£3.62 being the 3.5% increase on council tax over the previous year), quite a bit more than the other option. These are of course hugely simplified numbers, but if you think in millions of pounds you can see that just freezing for one year (which every council already did for this financial year) leaves councils way behind each year, even if they keep increasing council tax. 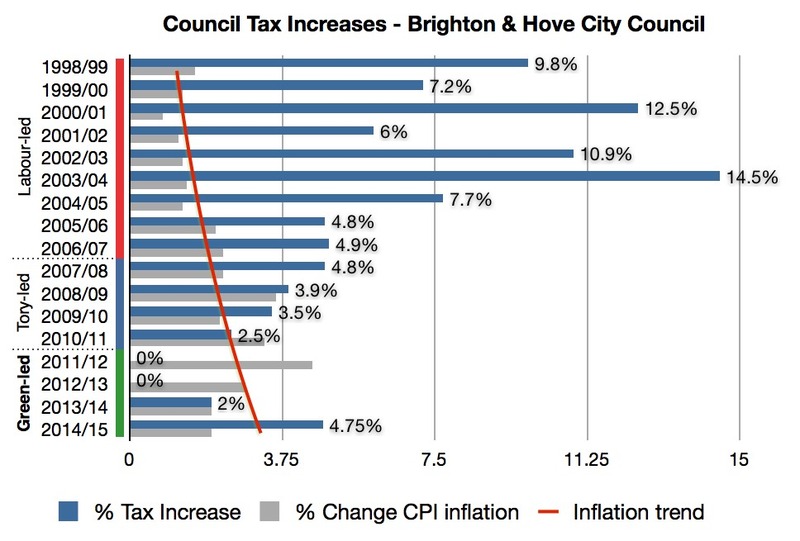 For Brighton & Hove accepting the one year freeze grant would mean £5.4m less income over 2 years. As we need to find savings of about £35m for the next two financial years, that £5.4m is money we can ill afford to give up. With inflation running at over 5% and councils not allowed to increase council tax beyond 3.5%, council income is falling further and further behind the increasing costs our service providers are experiencing, even if we do increase tax by as much as we’re allowed. The difference for the average council tax paying household in the city will be 57p a week, but the council can collectively use all those extra pennies to great use in protecting services and jobs the Tories would rather we axed. I’ve challenged the local Tories to list the extra £5.4m of service cuts they would propose if we adopt the grant as they are advocating. Brighton & Hove is not the kind of place where we want to give up on the elderly, marginalised or vulnerable – those most in need of help. We believe in civilisation, in public service and the greater good. A £3m grant that loses us £5.4m is not a good deal, how could it be? Accepting it would be agreeing to more Tory cuts, and acquiescing to the cynical politics of the Coalition government. As a Green, I resist. UPDATED 26/11/2011: Revised figures now show the lost income from taking the grant would be £5.4m (this post originally had the figure at £4m). I also have clarified the difference in cost to be 57p per household (previously I referred to tax payer which is imprecise as council tax applies to properties and not people). UPDATE 5/12/11: This interesting piece shows that most of the freeze grant has been taken from local government pensions funds. Completely unethical especially given the government rhetoric about the funds being a ‘burden’ which need more contributions.